Minor League Baseball announced today that the Pawtucket Red Soxare the recipients of the second annual John Henry Moss Community Service Award. The award was created in 2013 by Minor League Baseball in honor of the late John Henry Moss, who founded what would become the South Atlantic League in 1959 and headed the circuit until 2007. In its inaugural year, the Grand Junction Rockies were named the winners of the recognition. The Pawtucket Red Sox will receive their award at the Baseball Winter Meetings Banquet on Sunday, Dec. 7, at the Hilton San Diego Bayfront in San Diego, California. "The PawSox family is extremely honored to be selected for the 2014 John Henry Moss Community Service Award," said Pawtucket Red Sox President Mike Tamburro. "The role of any successful franchise must be to help lift those in its community who are in need. The past four decades we have quietly tried to do our part. "We take great pride in our ongoing efforts to enhance the quality of life within our community and for creating partnerships that have carried on for generations. We share this award with our community, our Major League partner the Boston Red Sox and our wonderful fans who make all our charitable efforts possible," added Tamburro. The Pawtucket Red Sox Charitable Trust has contributed to hundreds of charitable organizations and important causes in the area, donating more than $250,000 during the last five years. For almost 40 years, the PawSox have also contributed to local charities through the team's Ticket Fundraiser Program. This program has donated more than $200,000 over the last five years to worthy organizations such as American Parkinson's Disease Association and the American Cancer Society, among many others. The PawSox have also supported their community by hosting a number of fundraising events on non-gamedays including the Jeffrey Osborne Foundation, which benefits inner city youngsters in the Providence, Rhode Island, area. This event included an All-Star Softball Classic game held at McCoy Stadium featuring celebrities from the sports and entertainment worlds. Light the Night Leukemia Walk, held on Sept. 27, at McCoy Stadium, was another of the team's non-gameday events. Approximately 2,000 walkers participated and raised $250,000 for the Leukemia and Lymphoma Society. "It is well established that all members of the professional baseball family are extremely generous with their time, money and efforts in support of their local community," Randy Mobley, International League President, stated. "The heart of the Pawtucket Red Sox organization is big enough to not only fill Rhode Island, but much of New England. Following the lead of Mike Tamburro and Lou Schwechheimer, this organization has a well-earned reputation for being a selfless regional treasure that is ready to assist and lend its support to all that is good for the community." "The Pawtucket Red Sox commitment to their community has positively impacted countless organizations and individuals in Southeastern New England," Pat O'Conner, Minor League Baseball President & CEO, stated. 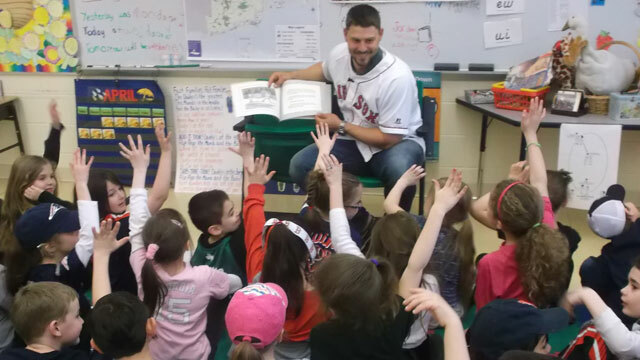 "Through the Pawtucket Red Sox Charitable Trust and a number of other philanthropic efforts, the PawSox have embodied one of Minor League Baseball's most important principles, giving back to the communities where our teams are located. On behalf of Minor League Baseball, I commend the team for their good work, and congratulate them on this honor." Minor League Baseball, headquartered in St. Petersburg, Florida, is the governing body for all professional baseball teams in the United States, Canada, Venezuela and the Dominican Republic that are affiliated with Major League Baseball clubs through their farm systems. Fans are coming out in unprecedented numbers to this one-of-a-kind experience that can only be found at Minor League Baseball ballparks. In 2014, Minor League Baseball attracted 42.4 million fans to its ballparks to see the future stars of the sport hone their skills. From the electricity in the stands to the excitement on the field, Minor League Baseball has provided affordable family-friendly entertainment to people of all ages since its founding in 1901. For more information about Minor League Baseball, visitwww.MiLB.com. The Pawtucket Red Sox have been the Triple-A affiliate of the Boston Red Sox since 1973, the second-longest Major League affiliation of any club in Triple-A Baseball. Known as the PawSox, the team plays in historic McCoy Stadium in Pawtucket, Rhode Island, which opened in 1942 and is the oldest ballpark in all of Triple-A. The "Longest Game in Professional Baseball History" took place at McCoy Stadium beginning April 18, 1981, and continuing to April 19 (until 4:09 a.m.) before finally being suspended with the game tied at 2-2 after 32-innings. The game was eventually resumed later that season on June 23 with the PawSox needing just one more inning to beat the Rochester Red Wings, 3-2 in 33-innings. Four Major League Baseball Hall of Famers have played for the PawSox including Carlton Fisk, Dennis Eckersley, Wade Boggs and Jim Rice, and Boston Red Sox Hall of Famers such as Fred Lynn, Roger Clemens, Bruce Hurst, Mo Vaughn and Nomar Garciaparra all played at McCoy Stadium before heading to Fenway Park in Boston. Current big league standouts like David Ortiz, Dustin Pedroia and Jon Lester also played for Pawtucket. On the field, the PawSox have won four International League Championships capturing the Governors' Cup in 1973, 1984 and now twice in the last three years (2012 & 2014).